Sunday night, we began the yearly battle known in our house as decorating the Christmas tree. First, I hauled the artificial tree from the basement, along with our waterlogged box of ornaments and set up operations in a corner of the living room. Then, I pieced together the tree, which emerges from its storage box with fewer branches each year as it moves inevitably toward Charlie Brown status. Next I untangled a sad strip of white lights, an emergency, late night purchase from a pharmacy a few years back when the multicolored ones declared an untimely work stoppage. Finally, we moved to the ornaments, the very center of the battlefield. The raw meat tossed to the lion. We have come a long way from the first Christmas my wife and I spent together. That year I shaped the base of the tiny tree we bought for her apartment using a steak knife, and we actually strung popcorn on thread to cover the bareness of a handful of ornaments and no star. Today, we have a big box of ornaments. And a teenage son drawn to shiny things. Clay doesn’t help decorate the tree per se. His special skills come into play after my wife, older son and I do our annual trip down memory lane as we work our way through the box looking for ornaments that haven’t been damaged already. (The rocking horse with no head. The double-amputee starfish. Half a John Deere tractor. You can’t hang them anymore, but you can’t throw them away. Don’t want to lose whatever precious memory is attached to each one.) Clay’s speciality is undecorating the tree before its time, and he went to work quickly. Within an hour of us finishing the decorating part, as we sat in the kitchen recovering, we heard the musical tinkle of a blue globe hitting the wood floor. When we moved in armed with dust pan and brush, we found that Clay also had removed the star from the top of the tree (which stopped lighting this year), and piled two Starbucks ornaments and a baseball on the windowsill. We rehung the star and the ornaments with full knowledge of the futility of the gesture. Within a half hour, the crystal tinkling sound was heard once again. This time, we lost a precious Grinch ornament. We had violated our normally inviolate rule: Don’t hang ornaments that are irreplaceable. They are best admired, touched and then shoved deep into the bottom of the decorations box, away from Mr. Busy Fingers. We took a chance, and lost. So be it. Over the years, we’ve also learned that most irreplaceable ornaments can be replaced via a search on eBay. The devastation continued until Monday evening when my wife took the wise step of moving the tree away from the stairs, which were giving Clay easy access to the higher ornaments. Duh. 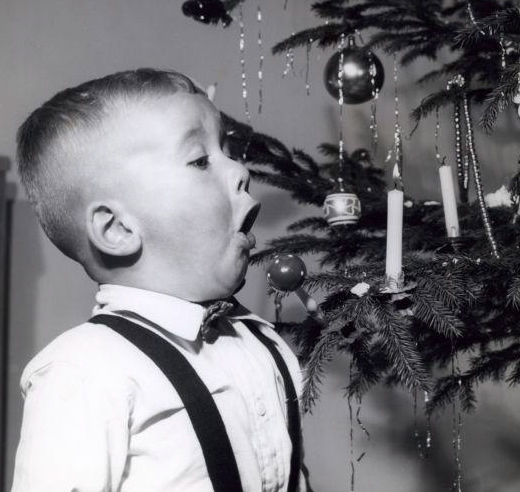 Sometimes, in defiance of all reason or logic, we stubbornly hold to our holiday traditions. Placing the tree by the steps. Displaying my wife’s fragile Santa collection on the mantel even though the Santas keep finding their way to odd corners of the house. 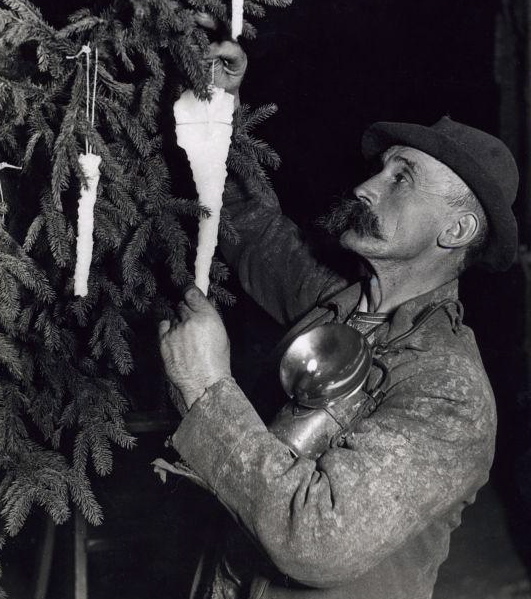 Hanging the fuzzy stockings before Christmas Eve knowing full well we’ll be looking at bare hooks within minutes. We keep testing the waters, thinking this year may be different. Sometimes it is. Sometimes you lose a Grinch ornament. The important thing is to not give up the fight. Of course, sometimes you just have to embrace the traditions you hadn’t planned on—like finding Clay in the living room at 10 p.m., dressed in nothing but a pair of socks, holding the fragile “Baby’s First Christmas 1995” globe, smiling, and way too far away to be reached if the ornament suddenly heads south. Ya gotta love the holidays. This entry was posted on December 22, 2010, 9:27 am and is filed under Daily Life, Silly Behaviors. You can follow any responses to this entry through RSS 2.0. You can leave a response, or trackback from your own site. We still have our tree up and there’s a Grinch ornament hanging where I can readily see it. Been thinking of Clay every time I see that ornament.